An insurer, in handling the defense of claims against the insured, has a duty to use the same degree of care and diligence as a person of ordinary care and prudence should exercise in the management of his own business. For when the insured has surrendered to the insurer all control over the handling of the claim, including all decisions with regard to litigation and settlement, then the insurer must assume a duty to exercise such control and make such decisions in good faith and with due regard for the interests of the insured. This good faith duty obligates the insurer to advise the insured of settlement opportunities, to advise as to the probable outcome of the litigation, to warn of the possibility of an excess judgment, and to advise the insured of any steps he might take to avoid same. The insurer must investigate the facts, give fair consideration to a settlement offer that is not unreasonable under the facts, and settle, if possible, where a reasonably prudent person, faced with the prospect of paying the total recovery, would do so … [w]here that duty is breached the insured [first-party] has a cause of action against the insurer. Despite the broad language of Gutierrez, some insurers have been able to limit their exposure to insured or “first-party” bad faith claims by adding creative language to their insurance contracts. In Shuster v. S. Broward Hosp. Dist. Physicians’ Prof’l Liab. Ins. Trust, 591 So. 2d 174 (Fla. 1992), an insurance company settled three medical malpractice claims against the insured within the policy limits, but the settlements resulted in the insured being unable to obtain medical malpractice insurance. The insured brought a first-party bad faith claim against the insurance company, but the trial court dismissed the action. Id. The Florida Supreme Court upheld the trial court’s decision to dismiss the bad faith claim because the policy at issue contained a “deems expedient” provision, in which both parties agreed in writing that the insurance company could investigate and settle as it “deems expedient.” Id. As a result, insurance companies put the insured on notice, through a provision in the insurance agreement, that the insurer had exclusive authority to control settlement and to be guided by its own self-interest when settling the claim for amounts within the policy limits, even where the claim was frivolous and without consideration of the insured’s interest. Shuster, 591 So. 2d at 176-77. Thus, Shuster significantly limited the insured’s ability to bring a bad faith claim against the insurer. (1) In addition to any other requirements imposed by law, each self-insurance policy as authorized under s. 627.357 or s. 624.462 or insurance policy providing coverage for claims arising out of the rendering of, or the failure to render, medical care or services, including those of the Florida Medical Malpractice Joint Underwriting Association, shall include … a clause authorizing the insurer or self-insurer to determine, to make, and to conclude, without the permission of the insured, any offer of admission of liability and for arbitration pursuant to s. 766.106, settlement offer, or offer of judgment, if the offer is within the policy limits. It is against public policy for any insurance or self-insurance policy to contain a clause giving the insured the exclusive right to veto any offer for admission of liability and for arbitration made pursuant to s. 766.106, settlement offer, or offer of judgment, when such offer is within the policy limits. However, any offer of admission of liability, settlement offer, or offer of judgment made by an insurer or self-insurer shall be made in good faith and in the best interests of the insured. § 627.4147, Fla. Stat. (2007). Although section 627.4147 gives the insurer the sole authority to settle a claim within the policy limits, it also requires the insurer to act in the best interests of the insured. This language is in contrast with Shuster, which permitted the insurer to settle a claim within the policy limits in its own self-interest. On May 16, 2007, the Fourth District Court of Appeal of Florida determined that insured parties could bring a bad faith cause of action under section 627.4147 against insurers who allegedly failed to act in the best interests of the insured. Rogers v. Chicago Ins. Co., 2007 WL 1427041 (Fla. 4th DCA 2007). The Court went on to say that in the context of a claim for medical malpractice, it may not always be in the best interests of the insured to concede liability, where none is present, and settle the claim within the policy limits. Id. Rogers is a major decision in the area of medical malpractice liability insurance because insurers can no longer rely exclusively on the Shuster decision, which protected insurers who inserted “deems expedient” or “self-interest” provisions into their insurance agreements. If they are not doing so already, medical malpractice liability insurers should take precautionary steps to protect themselves against potential first-party bad faith claims under section 627.4147. Most importantly, medical malpractice liability insurers may want to consider drafting and implementing policies that require the insurer to keep in close contact with the insured throughout the settlement process and carefully document all correspondence between the insurer and the insured regarding a potential settlement. Read also: Litster Frost Boise DUI lawyers. In recent years, premiums for insurance agency Errors and Omissions policies have increased for more than three-quarters of insurance agencies across the United States. See Stephanie Jones, Insurance Journal, What Does the Future Hold for Insurance Agents’ E&O? (2006). This trend has been noticeable in South Florida, in which property owners have frequently attempted to hold their insurance brokers responsible for a lapse in coverage in their homeowner’s policies, or due to the insurer’s denial of coverage. 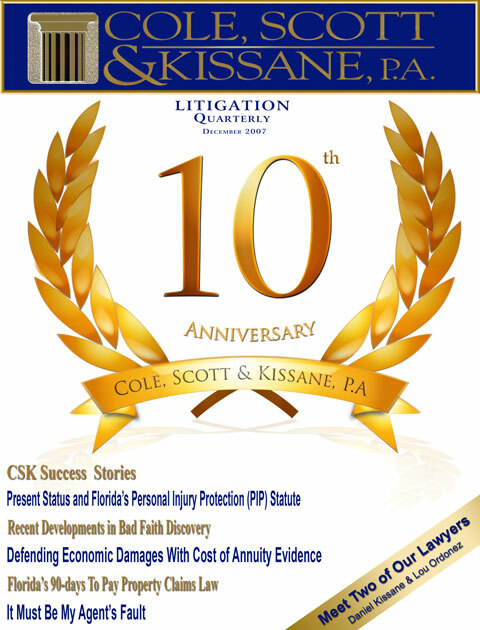 Some of these lawsuits have arisen when coverage has lapsed or been cancelled due to the failure of a property owner to pay the renewal premium for their homeowner’s policy in a timely manner before the arrival of one of the many destructive hurricanes that have blown through South Florida in recent years. As a general rule, Florida law provides that an insurance broker or independent insurance agent acts as the agent of the insured. See Amstar Ins. Co. v. Cadet, 862 So. 2d 736, 740 (Fla. 5th DCA 2003). An insurance broker differs from a captive agent because an insurance broker is not bound to work for or solicit insurance for any particular insurance company. See Amstar, 862 So. 2d at 739. In Florida, a person’s acts, not words, determine whether they are deemed to be an insurance broker or an insurance agent. See Boulton Agency, Inc. v. Phoenix Worldwide Indus., 698 So. 2d 1248, 1250 (Fla. 3d DCA 1997). The good news for insurance brokers is that Florida law has generally placed the responsibility to timely renew and pay premiums on the insurers and property owner themselves. Specifically, the Florida Supreme Court has held that an insurance broker’s employment is at an end when the agent procures insurance for the insured. See Cat’N Fiddle v. Century Ins. Co., 213 So. 2d 701, 704 (Fla. 1968). In Florida, an insurance broker is under a duty to notify the insured of a pending cancellation of a policy unless it is made to appear that the insured knew or reasonably should have known about the cancellation from sources other than the agent. See Thal v. Shiman, 524 So. 2d 1156, 1156-7 (Fla. 3d DCA 1988). Since Florida law requires an insurer to mail the notice of cancellation directly to the insured with an open copy to the broker, an insurance broker is generally under no further duty to inform the insured about the pending cancellation of the policy after receipt of the notice of cancellation. See Thal, 524 So. 2d at 1156-7; See also § 627.728(3) (a), Florida Statutes. Likewise, an insurance broker also owes no duty to the insurer to forward a defective notice of cancellation to the insured. See Don Slack Ins. Inc.v. Fidelity Cas. Co. of New York, 385 So. 2d 1061, 1064 (Fla. 5th DCA 1980). Although some insurance brokers call their respective insured-clients after receipt of a cancellation notice from the insurance carrier, Florida courts have found that proof of mailing a notice of a cancellation to a named insured at the address stated in the policy constitutes sufficient compliance with policy provisions requiring notice of cancellation to the insured. Burgos v. Indep. Fire Ins. Co., 371 So. 2d 539, 541 (Fla. 3d DCA 1979). If a lawsuit does later arise, an insurer’s proof of mailing of a notice of cancellation to the insured prevails as a matter of law over the insured’s denial as to its receipt. Ruiz v. Fortune Ins. Co., 677 So. 2d 1336, 1338 (Fla. 3d DCA 1996). If cancellation does occur, an insurance broker is generally not under a duty to obtain replacement insurance coverage for the insured unless there is an agreement to do so between the broker and the insured. See Burgos, 371 So. 2d at 541. Despite these apparent protections for insurance brokers, there are still some steps that insurance brokers may wish to take in order to protect themselves against potential lawsuits arising from cancellation and an insurer’s denial of coverage, and in order to better serve their insured-clients. First, the broker should meet with and discuss with the insured the coverage requested. In this meeting, the broker should ensure that the insured completes a written insurance application in their own handwriting in order to avoid any transcription errors by the insurance broker. Second, upon obtaining a proposal from prospective insurers, the broker should put forward a detailed insurance proposal for the insured’s review and approval, and explain all proposed coverage to the insured. If the insured agrees with the proposed coverage, then the broker should request that the insured sign the proposal so that there will be no confusion regarding the coverage requested by the insured. With respect to notices of cancellation, it may be advisable for the broker or customer service representative to verify the insured’s address on the notice in order to ensure that notice contains the insured’s correct mailing address, as stated in the policy. If the insured’s address is correct, the insurance broker can reasonably expect that the insured has received notice of the cancellation in accordance with Florida law. As a second step, it may be advisable for the broker to send an email or letter to the insured and attach a copy of the insurer’s notice of cancellation, although Florida law requires no such duty. However, this will enable the broker to prove their attempt to notify the insured about the notice of cancellation in the event that litigation later arises. As a final measure, the insurance broker should document all verbal decisions that the insured makes with respect to the continuance or cancellation of insurance coverage in a brief email or letter to the insured so that all parties will be clear with respect to the insured’s coverage decisions. As hurricanes become more frequent in South Florida, insurance brokers can expect that unhappy homeowners may attempt to make them the scapegoat for the insurers’ denial of coverage or for the failure of the insured to timely renew their own policies. 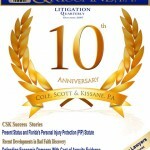 Although Florida law generally places the responsibility of these matters with the insurers and insureds, insurance brokers would be well advised to take some additional steps in order to protect themselves from E&O liability, litigation costs and increased E&O premiums, as well as to better serve their insured-clients. Over the past several months, Florida’s Personal Injury Protection (PIP) law has undergone some significant changes. First, effective October 1, 2007, the “old” version of the PIP law was allowed to sunset. During the sunset period, Florida’s Legislature passed and the Governor signed a new PIP law. This law took effect on January 1, 2008. As a result, some currently pending PIP claims may be subject to the old law, the new law, or the time period from October 1, 2007 through January 1, 2008 when Florida had no mandatory PIP. This article explores the changes in the PIP law ad how they may affect the handling and evaluation of claims. As aforementioned, On October 11, 2007, Governor Charlie Crist signed the proposed No-fault bill into law effective January 1, 2008. PIP will continue to pay 80% of medical expenses up to $10,000.00, but the benefits are limited to services and care provided, lawfully supervised, ordered, or prescribed by: medical doctor, osteopath, physician, allopathic, physician, dentist or provided by hospital or ambulatory surgical center; emergency transportation and treatment by an ambulance or emergency medical technician; chiropractic physician; entities wholly owned M.D, osteopathic physician, allopathic physician, chiropractors, dentists, or such practitioners and their spouse, parent, child or sibling; entities wholly owned by a hospital or hospitals; and, licensed health care clinics that are accredited by a specified accrediting organization or the health care clinic has a medical director that is a Florida licensed physician, osteopath or chiropractor, has either been continuously licensed for more than 3 years or is a publicly traded corporation and provides at least four of the following medical specialties: general medicine, radiography, orthopedic medicine, physical medicine, physical therapy, physical rehabilitation, prescribing or dispending medication and laboratory services. Ø If the medical care is not reimbursable under either Medicare or workers compensation, the insurer is not required to pay. 2.? ?Charges for medically necessary cephalic thermo_grams, peripheral thermograms, spinal ultrasounds, extremity ultrasounds, video fluoroscopy, and surface electromyography shall not exceed the maximum reimbursement allowance for such procedures as set forth in the applicable fee schedule or other payment methodology established pursuant to s. 440.13. 3.? ?Allowable amounts that may be charged to a personal injury protection insurance insurer and insured for medically necessary nerve conduction testing when done in conjunction with a needle electromyography procedure and both are performed and billed solely by a physician licensed under chapter 458, chapter 459, chapter 460, or chapter 461 who is also certified by the American Board of Electrodiagnostic Medicine or by a board recognized by the American Board of Medical Specialties or the American Osteopathic Association or who holds diplomate status with the American Chiropractic Neurology Board or its predecessors shall not exceed 200 percent of the allowable amount under the participating physician fee schedule of Medicare Part B for year 2001, for the area in which the treatment was rendered, adjusted annually on August 1 to reflect the prior calendar year’s changes in the annual Medical Care Item of the Consumer Price Index for All Urban Consumers in the South Region as determined by the Bureau of Labor Statistics of the United States Department of Labor. 4.? ?Allowable amounts that may be charged to a personal injury protection insurance insurer and insured for medically necessary nerve conduction testing that does not meet the requirements of subparagraph 3. shall not exceed the applicable fee schedule or other payment methodology established pursuant to s. 440.13. 5.? ?Allowable amounts that may be charged to a personal injury protection insurance insurer and insured for magnetic resonance imaging services shall not exceed 175 percent of the allowable amount under the participating physician fee schedule of Medicare Part B for year 2001, for the area in which the treatment was rendered, adjusted annually on August 1 to reflect the prior calendar year’s changes in the annual Medical Care Item of the Consumer Price Index for All Urban Consumers in the South Region as determined by the Bureau of Labor Statistics of the United States Department of Labor for the 12-month period ending June 30 of that year, except that allowable amounts that may be charged to a personal injury protection insurance insurer and insured for magnetic resonance imaging services provided in facilities accredited by the Accreditation Association for Ambulatory Health Care, the American College of Radiology, or the Joint Commission on Accreditation of Healthcare Organizations shall not exceed 200 percent of the allowable amount under the participating physician fee schedule of Medicare Part B for year 2001, for the area in which the treatment was rendered, adjusted annually on August 1 to reflect the prior calendar year’s changes in the annual Medical Care Item of the Consumer Price Index for All Urban Consumers in the South Region as determined by the Bureau of Labor Statistics of the United States Department of Labor for the 12-month period ending June 30 of that year. This paragraph does not apply to charges for magnetic resonance imaging services and nerve conduction testing for inpatients and emergency services and care as defined in chapter 395 rendered by facilities licensed under chapter 395. The PIP fee schedule referenced above would apply instead. If the PIP insurer receives notice of an accident, the insurer must reserve $5,000.00 of PIP benefits for payment to physicians or dentists rendering emergency care or inpatient care in the hospital for 30 days. After the 30 day period, the unclaimed amount of the reserve may be used to pay claims from other providers. The required time to pay claims to other providers is tolled for the time period the insurer is required to hold such claims due to this requirement. Ø Makes it an unfair trade practice for an insurer to refuse to pay valid claims as a general business practice, and allows the Attorney General to investigate and initiate actions, in addition to the Office of Insurance Regulation. With these changes, Florida has shifted from a No-Fault system to a fault- based or tort system, whereby the at fault driver is responsible for paying the claimant’s medical expenses and compensating for additional damages, such as loss of wages and “pain and suffering.” In addition, claimants are no longer required to have suffered a threshold “permanent” injury in order to recover non-economic damages, such as pain and suffering and mental anguish. Again, dependent upon individual contracts of insurance, No-Fault coverage may or may not be a “collateral source” and may be subrogable. Naturally, Florida’s courts have not had the opportunity to interpret the changes in Florida’s PIP statute. Therefore, it is imperative that appellate decisions be closely monitored to see how the courts are treating these important issues. We will keep you informed of any new developments, legislative or otherwise, on Florida’s PIP law.